Whether you’re a mad-keen scholar of all things Korean or just that it’s cold outside and you want to kill an hour, check out the Kyobo Book Shop. The Kyobo Book Shop has 3 branches around Seoul, but the Gangnam centre is definitely the best (and is officially Korea’s largest bookshop!). 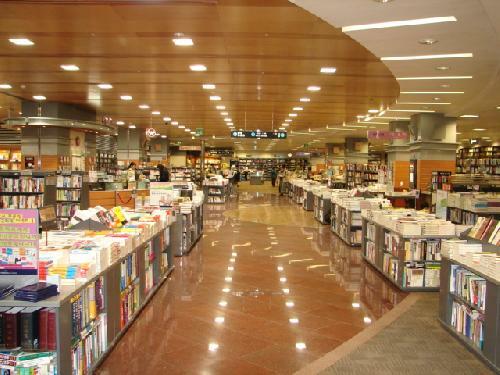 It’s located over at the other side of the station from Lexis Seoul – about a 15 minute walk. The Kyobo has a huge selection of foreign books, and the best range of Korean language texts that I’ve seen. If you need a new dictionary or reader, it’s hard to beat the Kyobo. Prices are very competitive, too. There’s no pressure to buy anything at the Kyobo, and it often feels more like a library than a book shop, with customers settling down in easy chairs for a quiet morning with their favourite novel. Hint: If you want to try out some translated Korean fiction, check out anything by Young-Ha Kim, Suki Kim or Kyung-Sook Shin…all great reads!